Lake Tahoe Getaway! Whether you love skiing in the winter or nature and the beach in the summer, this is the perfect vacation rental house for any season. At our home away from home, we offer premium amenities, an ideal location, and surroundings well-suited for an array of recreational hobbies. 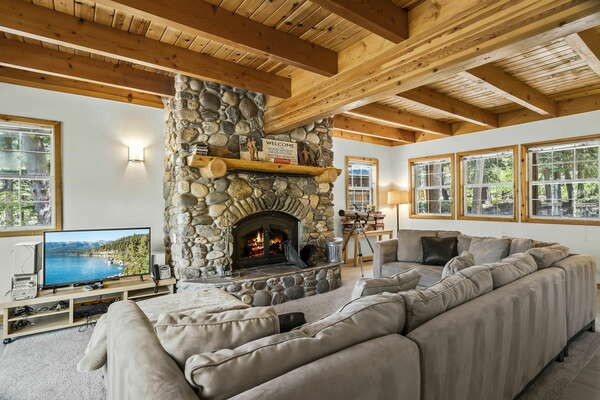 This modern, yet cozy North Shore Tahoe vacation home features a large open floor plan that the whole family can enjoy (including 4-legged ones, this rental is Pet-Friendly). With 4 bedrooms, there is also enough private space to take a break. After your daytime of exploring North Lake Tahoe, relax with a home cooked meal in the newly remodeled kitchen and enjoy a movie by the fire — or in bed — on a large screen TV. As you enter this vacation house you’ll find 3 bedrooms on the first floor with a full bathroom and the laundry room. The reverse floor plan provides living area, kitchen and master suite upstairs, nestled in the trees with gorgeous views and large windows surrounding you, seating for your entire family, a dining table for 10 and a fully stocked kitchen. The master bedroom in this North Lake Tahoe vacation rental home has a King Size Bed, a mounted TV on the wall and a walk-in closet, with full bathroom. Only off the living room you’ll find the wrap around deck with a BBQ and sitting. Enjoy your morning coffee or a glass of wine in true North Lake Tahoe surroundings. Access to Tahoe National Forest trails is directly across the driveway , and an array of shops and restaurants, as well as movie theater and the beach with boat ramp, are all within walking distance. Kings Beach is unique in that it has a state park with long white sandy beaches. Here you can rent a kayak, jet ski, and other water toys, or just relax on the shoreline with a good book. Some of the best North Shore Lake Tahoe restaurants and golf courses are here, along with shops offering local artist fares. Nightlife? YES. Crystal Bay is 3 miles away and offers gambling, nighttime shows, and Tahoe nostalgia of the Frank Sinatra days at CalNeva. Recreational amenities are clustered near the North Lake Tahoe sandy beach, where a lakefront promenade extends through the site westward into the state recreation area. Here, you will find picnic tables, barbecue areas, and benches with unsurpassed Lake Tahoe views. A basketball court at the eastern end of the site lets people play in a spectacular beachfront setting.